Dark Eyelids – What is it? How to get rid of dark eyelids ? The human eyelid is made up of thin skin and acts as a protection for the eyes. Dark eyelids or medically termed Periorbital dark circles are dark discoloration around the eyes. 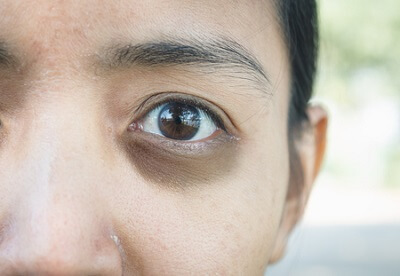 Inflammation: Dark circles or hyperpigmentation in the area surrounding the eyes is sometimes the resulting factor of tissue damage from acute trauma. Conditions like Styes, Chalazia, Blepharitis, etc. can lead to severe darkening of the skin around the eyes. Allergic reaction: Allergic conjunctivitis, allergic rhinitis leads to excessive rubbing of the eyes which leads to darkening of the skin and is called allergic contact dermatitis. Injury: Sustained during an accident or intentional trauma during competitive wrestling/boxing leads to prolonged and severe darkening of the eyelids. Irritation: Chemical irritants like the ones present in shampoos, hair sprays, styling gels, etc. could lead to irritation of the skin around the eyes. Insomnia: Lack of sleep could lead to prolonged darkening of the eyelids and result in the blood vessels around the eyes to become dilated. This excess flow of blood makes the eyelids appear darker than usual. Nutrient Deficiency: Vitamin B deficiency, iron deficiency, anemia, etc. Topical agents: Nonphenolic and phenolic bleaching agents are used for treating hyperpigmentation. Hydroquinone: Abundantly used bleaching agent made as a solution containing only 2 – 6 % Hydroquinone, is applied in small doses over a period of 5 – 7 months. Note: Hydroquinone usage causes side effects like mild to severe side effects. Skin irritation, itching, inflammation, nail discoloration are some of them. Kojic acid: Naturally occurring derivative made from a fungal agent sourced from the Penicillium and Aspergillus species. Azelaic acid (AzA): The Azelaic acid or 1,7- heptane dicarboxylic acid is the most preferred anti-acne agent. Azelaic acid treats certain hyper pigmentary disorders like melasma. Arbutin: The extract derived from bearberry shrub, pear, cranberry and blueberry plants. Sunscreens: Can also be used by individuals suffering from darkened eyelids and cases of melasma. Note: Take extra care while applying sunscreen on the delicate skin around the eyes.